Orbis International is committed to eradicating avoidable blindness around the world. Karishma Tulsidas meets the people behind the charity that has produced an inspiring documentary film, narrated by Omega ambassador Cindy Crawford. Imagine a dc-10 aircraft stripped of its cramped seats, and instead fitted with a fully equipped surgical theatre wherein operations can be performed to restore the eyesight of needy people around the world. This was the vision for Orbis International’s Hospital in the Sky programme, when it was established in the 1970s by a group of ophthalmologists in the US. Their aim was to eradicate preventable blindness—80 per cent of visual impairment in the world can be cured—by creating sustainable programmes in developing countries around the world. Today, the Flying Eye Hospital has become an emblem for Orbis, a symbol of its commitment to travel to the most obscure of places to not just conduct one-off surgeries on a group of patients, but also to build up a sustainable system by training the local doctors to continue the mission. Since the 1980s, Orbis has been to some 92 countries around the world. In fact, Singapore was one of its beneficiaries when it first started. Paul Forrest, chief development officer of Orbis, reveals the charity conducted medical programmes in Singapore in the beginning, and the nation has gone on to pay it forward. “We worked very closely with [pioneering eye surgeon] Dr Arthur Lim,” he says. “We have watched Singapore grow and develop, and now it’s the complete opposite. Your doctors volunteer to join our programmes in Asia and around the world. And we also take doctors from developing countries around the world to train in Singapore. We do the long-term training at the Singapore National Eye Centre.” For that reason, and also because it’s a springboard for neighbouring countries such as Indonesia and the Philippines, Singapore was chosen as one of Orbis’ Southeast Asian bases. The long-term success of Orbis can be witnessed in the lives of the people the organisation has helped: with restored eyesight, they can have access to proper education, eventually enter the workforce, create a life for themselves and in turn play their small part in the country’s economy. It is this humanitarian cause that attracted corporate sponsor Omega. Their partnership started in 2011, and their first project was a documentary featuring Daniel Craig. The Omega brand ambassador travelled to Mongolia to gain an insight into the workings of an Orbis mission, and learnt how a simple eye surgery—readily available in the first world—can forever alter the life of a person. 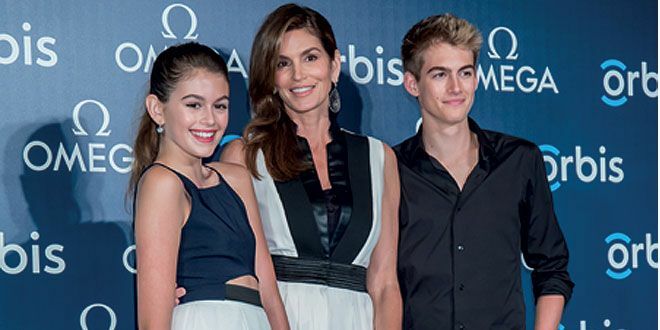 Cindy Crawford, another long-term ambassador for Omega, was invited to voice over a second documentary for Orbis. This time, the Flying Eye Hospital was the focus of the movie. She and her daughter Kaia Gerber (the 13 year old recently made her modelling debut in Vogue), travelled to Peru to witness a team of highly skilled ophthalmologists perform surgery on children with preventable visual impairment, and the elderly with cataracts. Due to limited resources and time, the team held a selection process to choose the candidates for surgery. But the rest of the candidates have a fair shot in the future: within the flying hospital is a classroom where a big screen instantly captures the surgery occurring real-time in the theatre, so training doctors can learn from the best surgeons. There is no fancy equipment: the doctors use the tools that are available in the country, so the locals can continue the good work.